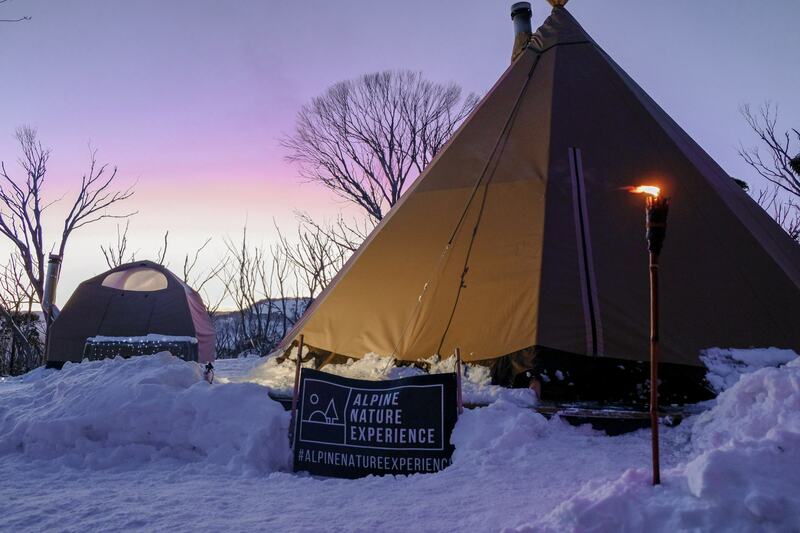 The Alpine Nature Experience is, without a doubt, a night that will stay with you forever. 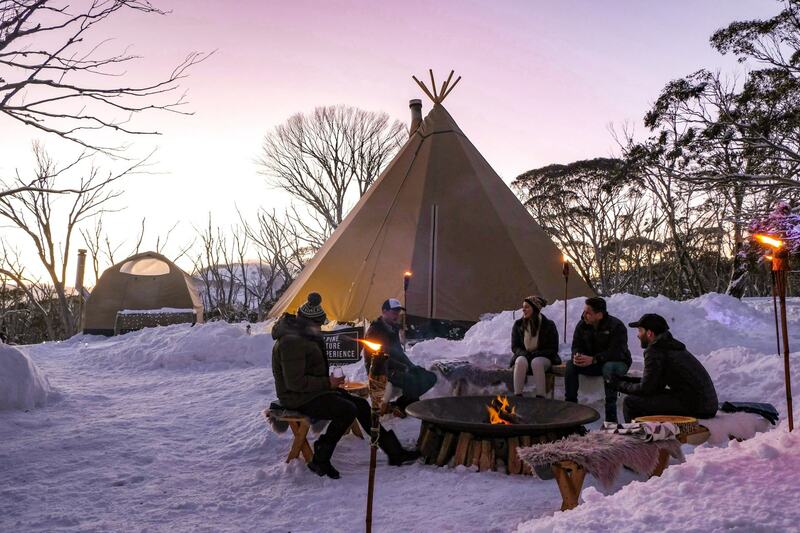 Nestled away amongst the snow gum trees in the wilderness of Mount Hotham you can find the little eco-village that is the home to this unforgettable nature experience. 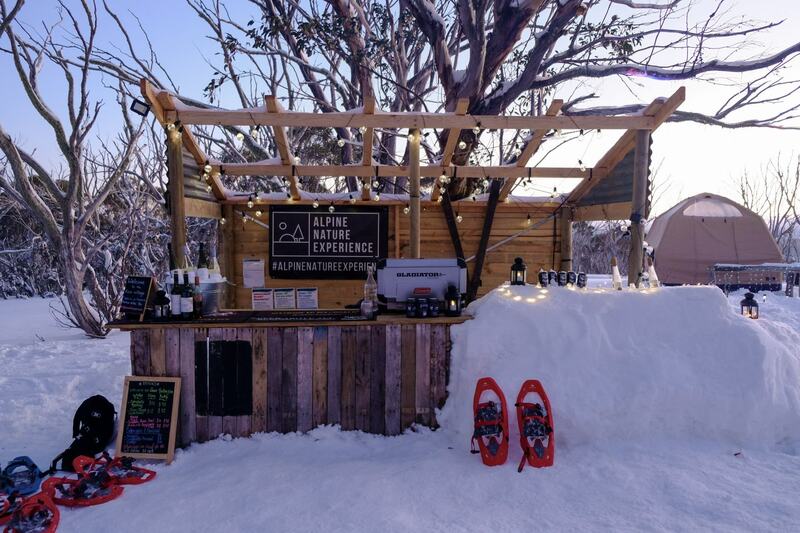 Carefully designed and created by Jean-François Rupp, the Alpine Nature Experience is unlike anything else you will find at the snow. 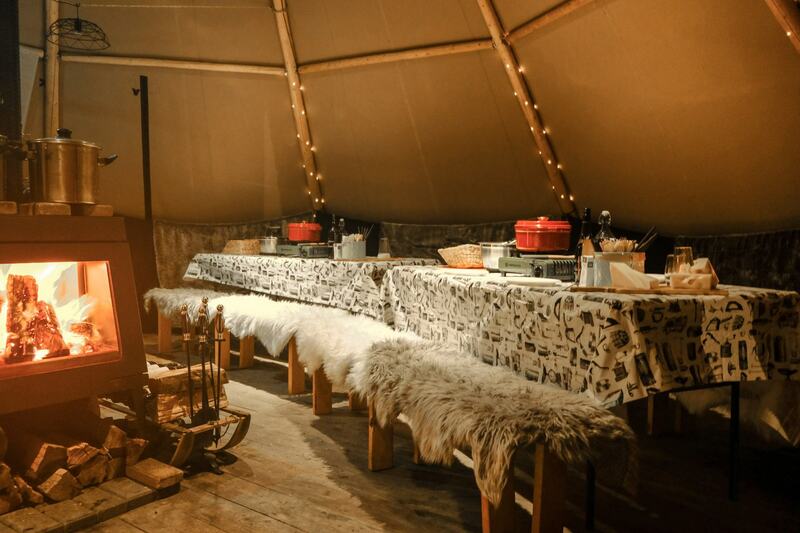 It’s an evening of mulled wine, cheese fondue, making friends, sharing stories and watching the stars from your bed in your cosy snow-dome tent. We were lucky enough to visit the Alpine Nature Experience a few weeks ago, and we must admit, Jean-François has created something truly beautiful here. 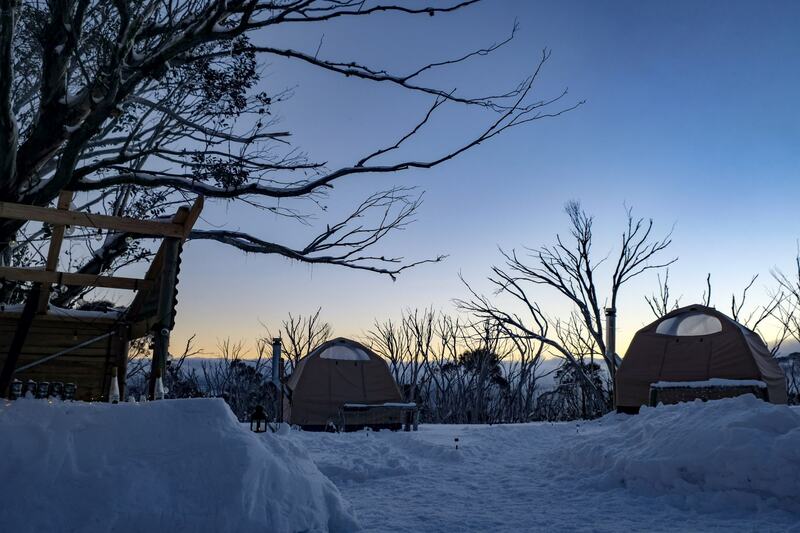 The evening started at Wire Plain on Mount Hotham, an easy meeting point less than a 5 minute walk from the overnight car park. We met Jean-François and were delighted to find out we had booked on a night with just one other couple! Such a lovely intimate group to share this unique evening. The first part of the evening is called Snowshoe to Fondue – and includes a leisurely walk through the snow to the Nature Experience’s eco-village, followed by a delicious 3 course cheese fondue dinner. Strapping on a pair of snowshoes each, we started to make our way through the trees towards the eco-village. After sinking knee-deep into soft snow three times already that day, walking with the snowshoes was a much easier way to do it. The walk to the eco-village was relativity easy, only about 450m, and took about 30 minutes, as we stopped to learn more about the environment and alpine history, and have a couple of rests along the way. Walking in the snow does require a little more energy than normal! Along the way Jean-François shared stories with us of both the French and Australian alps, offering an insight into the history of the regions and his experience living in both. He was also sure to point out some of the more unique characteristics of the plants and trees in Victoria’s alpine region. 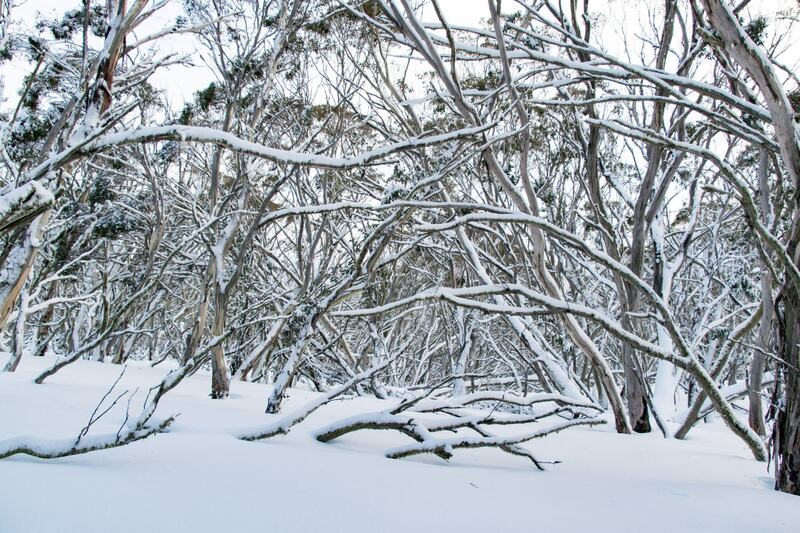 Like the snow-gum trees, that have evolved to ensure snow falls off them, rather than weighing heavily and dragging them down. We arrived at the eco-village around sunset, greeted with a beautiful clear sky, a roaring warm fire and just really a stunning setting. 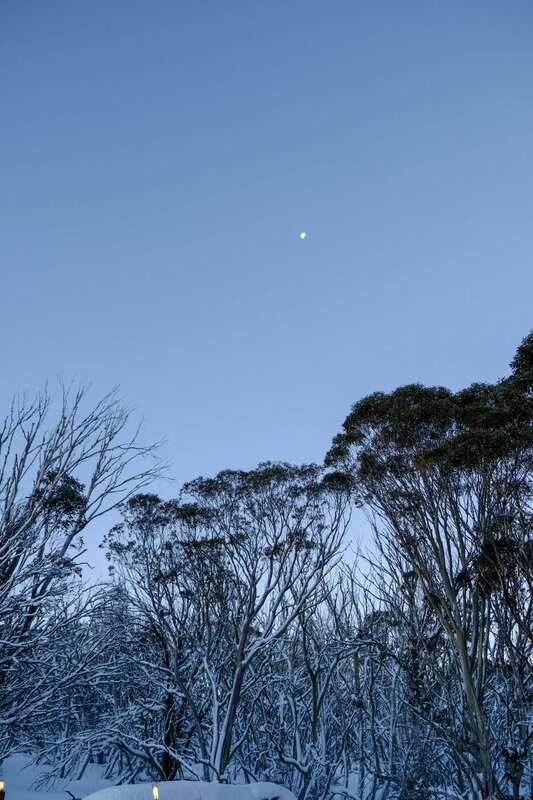 Having spent most of the day on Hotham in a fog that felt like the middle of an actual cloud, this clear sky was oh so welcome. 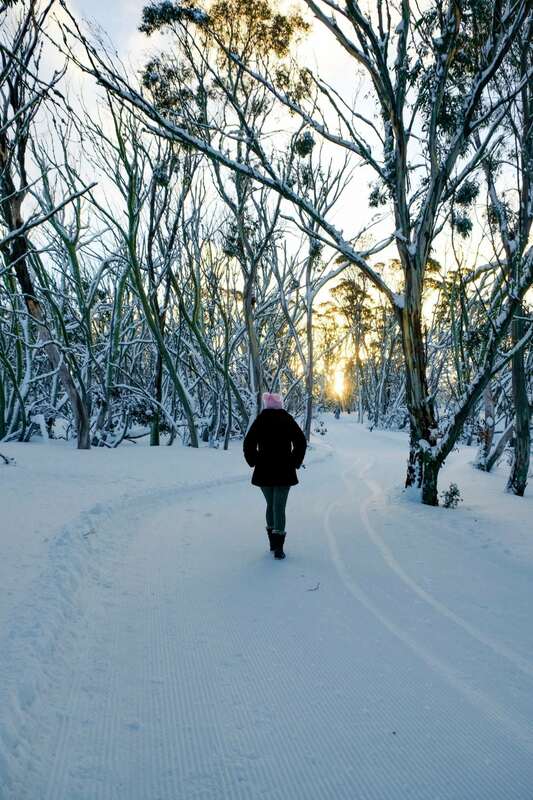 The Alpine Nature Experience eco-village is the ultimate Winter Wonderland, with a thick layer of snow coating the ground, the trees and everything around us. 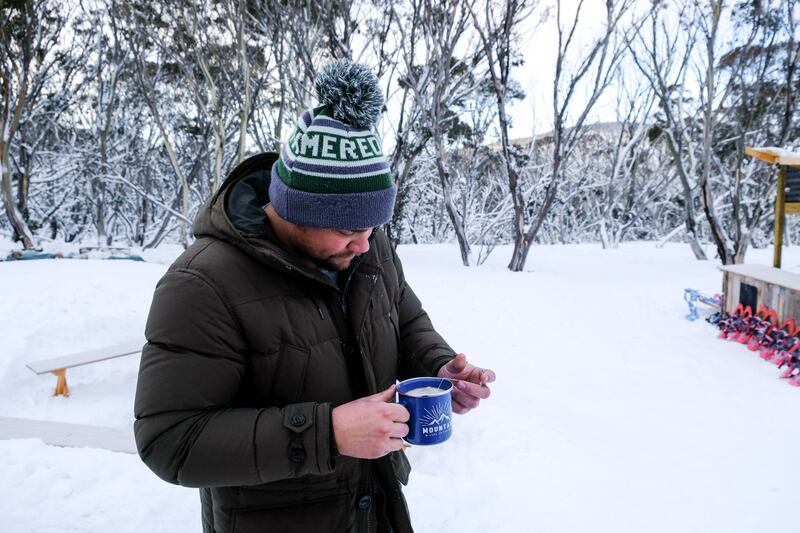 After dropping our bags and a quick tour of our snow-dome home for the night, we settled down by the fire with a glass of warm mulled wine, which Thom quickly decided tasted just like hot cross buns. 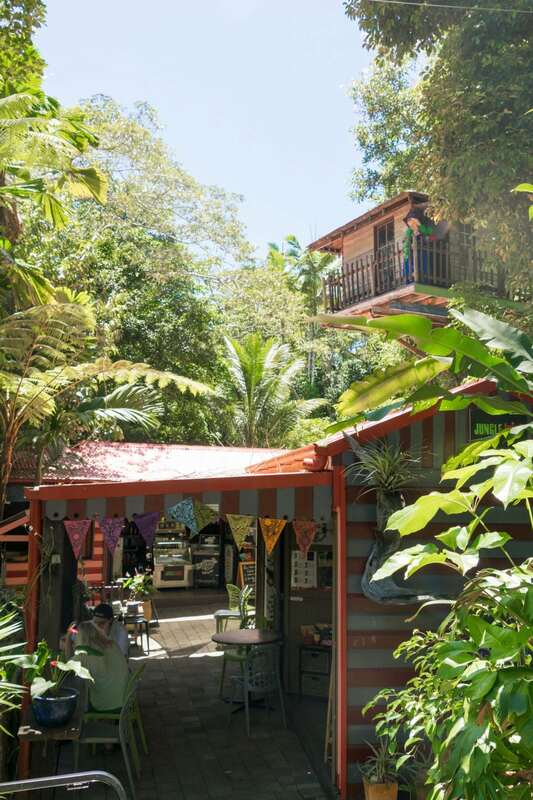 A quick look into the details of the eco-village. Now in it’s second season, Jean-François and the team at Alpine Nature Experience construct the eco-village each year, carrying everything in and out by hand to reduce the impact of the village and it’s guests on the fragile alpine environment. Power – the power works off batteries, so while it’s a little bit limited there’s still definitely enough power to charge your phone or camera. 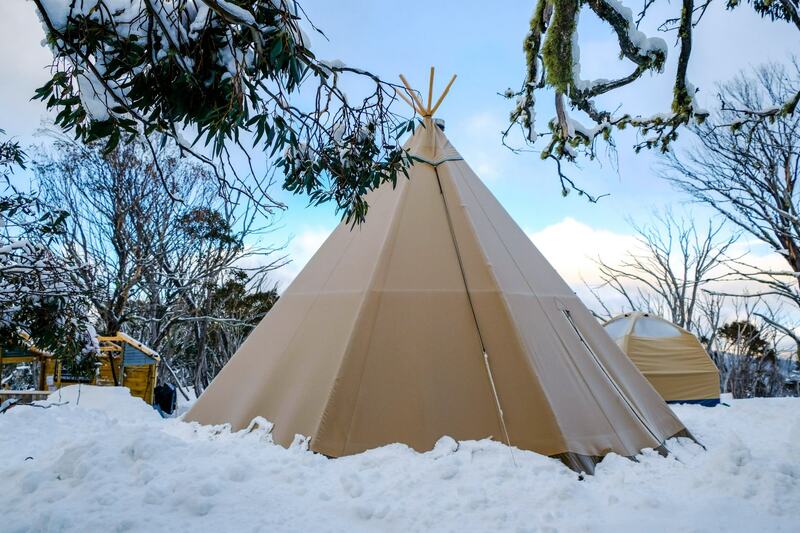 Heated snow dome tents – each tent and the main teepee all have their own fire in them to keep you nice and toasty. 4G phone connection – you don’t actually have to disconnect if you don’t want to! Credit card facilities to pay for any extra drinks you have in the teepee. Dry toilets and hand washing facilities. We had a couple of glasses of mulled wine around the fire as a group, sharing stories of our travels and adventures as the night set in. 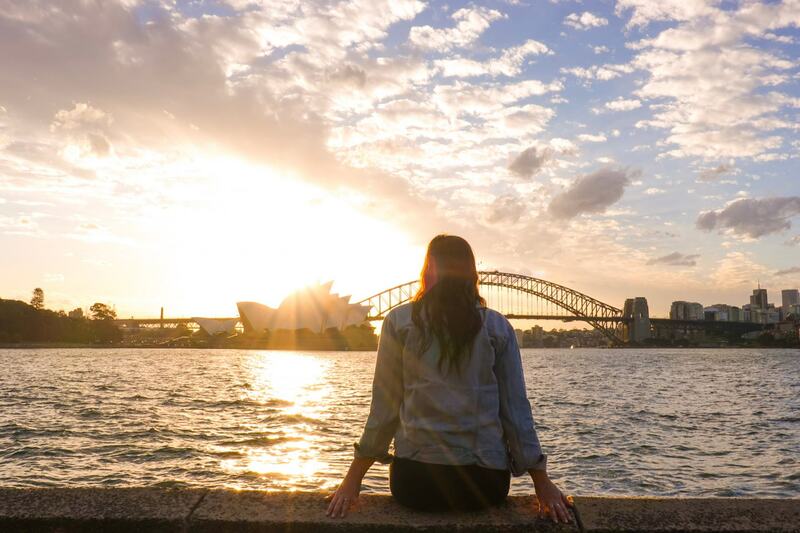 The other couple on our tour had moved to Australia from Brazil, and Jean-François had moved to Australia from France after marrying a girl from Albury, so as you can imagine, there were plenty of travel experiences between us. 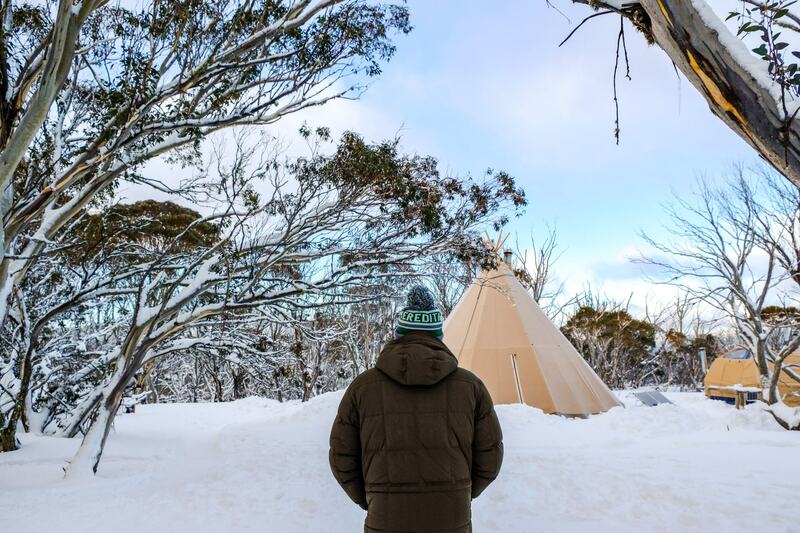 When it started to get a little too cold, we moved inside the main teepee where a roaring coonara kept us all warm. Together we had a little bit of a cooking class to learn how to make the perfect French fondue. The food was just delicious. In addition to the cheese fondue there was homemade pumpkin soup from the local Harrietville Bakery, an accompanying salad, cake for desert, a traditional French shot and many wines. Whoever thought a fondue meal could make you so full?! If you choose to end the night after the fondue, you will take a short snowshoe walk back to Wire Plain. 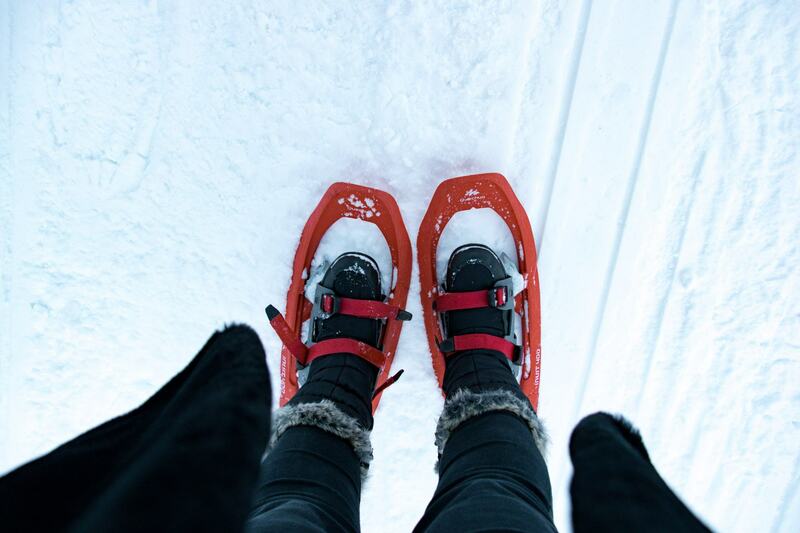 Includes: A guided snowshoe walk through the snow, a glass of mulled wine on arrival, a 3 course dinner including a French cheese fondue cooking class. The Alpine Nature Experience evenings run from Wednesday to Sunday, starting at about 4:30pm in June and July and then 5pm through August and September, and returning after dinner at about 9:30pm. The second part of the nature experience is called Igloo to Skidoo, and includes a sleepover in the snowy dome tents of the eco-village. As dinner came to an end, and everyone had tummies full of wine and cheese we headed to our snow-dome tents to settle in for the night. 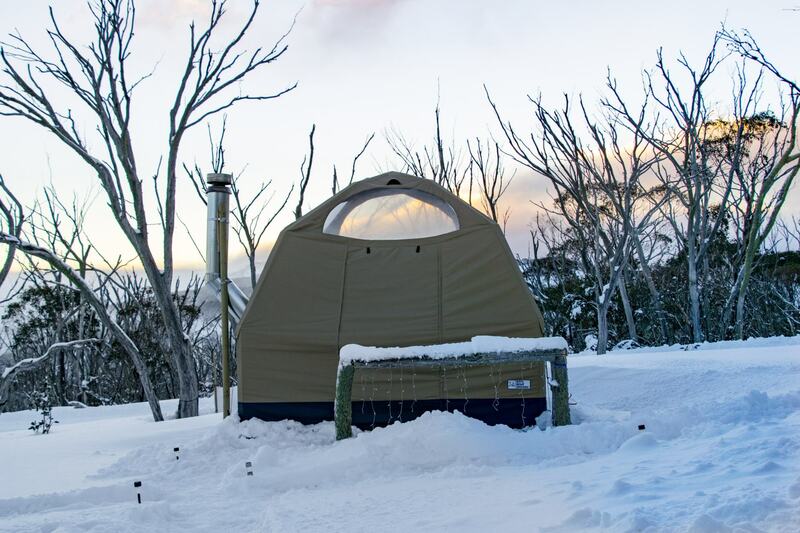 Each snow-dome tent also has it’s own coonara inside, which had been kindly lit for us before we turned in for the night, so our little snow-dome was lovely and warm before we arrived. One of the best things about the snow-dome tent is that it has a clear roof. Since we were blessed with a lovely clear night we had a beautiful view of the starry night sky right from our bed. We got warm and cosy under the covers and watched the stars until we fell asleep. 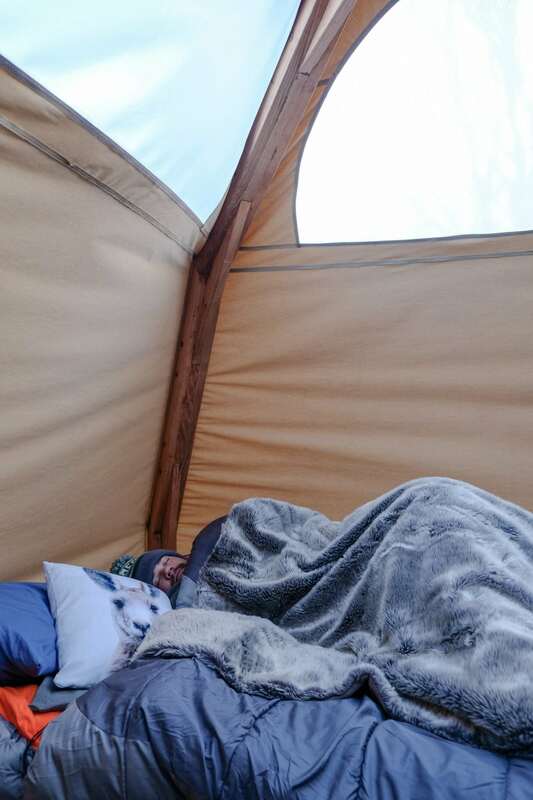 Never did I think I could be so warm when it was -6 degrees outside ( and we were sleeping in a tent ), but the beds inside the snow-dome were so warm and comfortable. Put together with a -10 degrees double sleeping bag and a variety of fleece and fur blankets, we didn’t even feel a breeze for the whole night. Thom did not want to get out of bed in the morning! 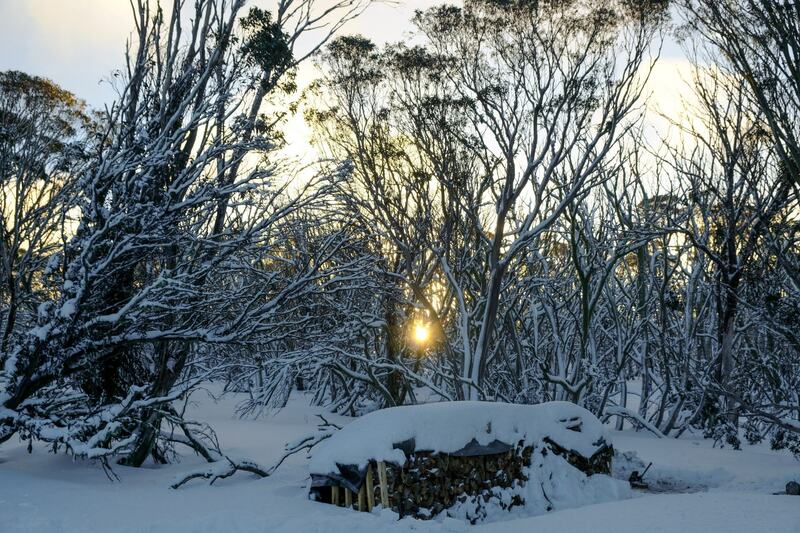 We woke up early in the morning to watch the sunrise over through the snowy trees. Getting out of our warm bed and heading out into the snow was incredibly difficult though. It was -4 degrees in the morning, not really an inviting temperature for anyone to leave their bed. I jumped in and out of bed about 5 times before I committed to getting up and heading into the snow! We took a walk around the eco-village as the sun rose, checking out the views over the valleys before heading into the central teepee for breakfast. Jean-François cooked up some delicious bacon and egg sandwiches and hot drinks, to keep everyone warm in the cold temperatures of the morning. Of course, the fire in the teepee was defrosting us all as well. As our time at the eco-village came to an end we said goodbye to Jean-François, and were picked up by Steve from SnowStuffPark for a ski-mobile ride back to Wire Plain. 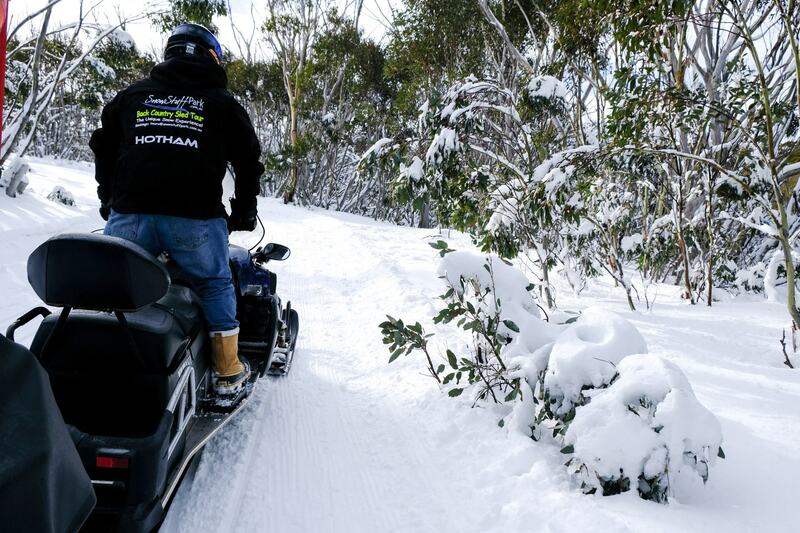 Our skidoo ride took about 15 minutes, and Steve pointed out a few different highlights of the alpine region, including a lookout where you could see Mount Buller in the distance! 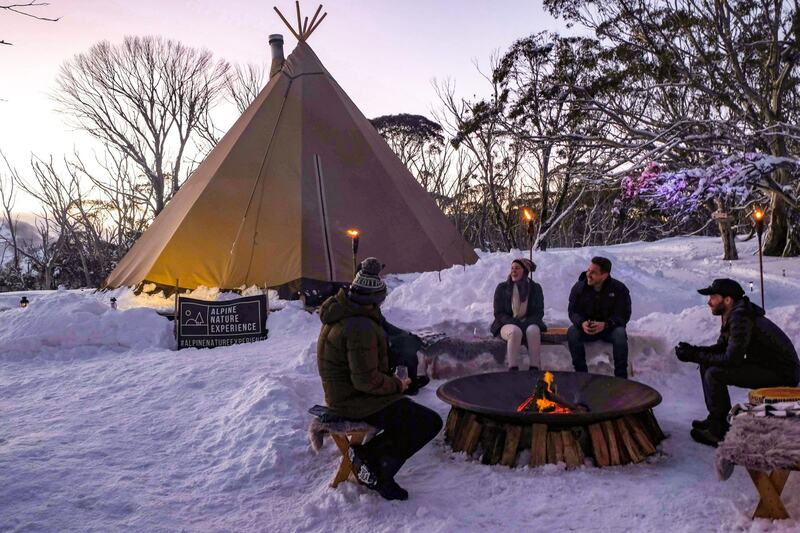 A private snow-dome for 2 people costs $180 AUD per adult ($360 AUD for a couple), and must be booked in conjunction with the Snowshoe to Fondue dinner experience. 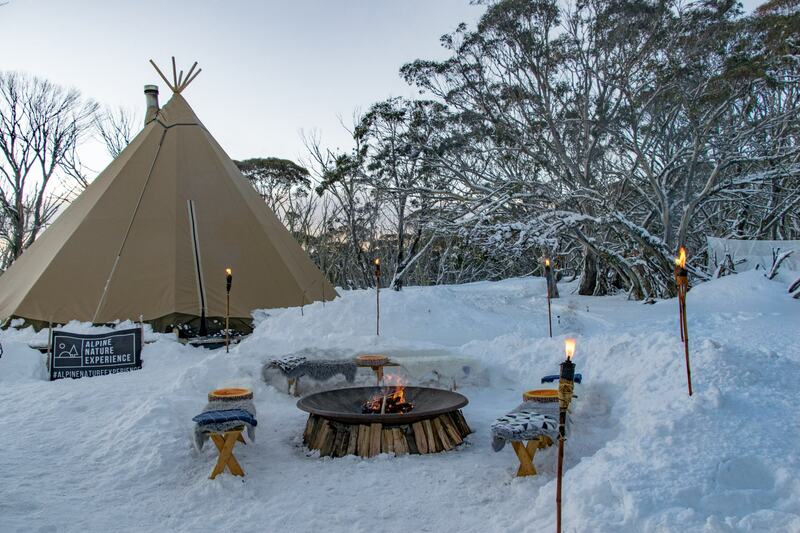 A complete night in the snow and the ultimate nature experience costs $578 AUD for two people. Includes: Overnight accommodation in snow-domes, all bedding (including a -10 degrees sleeping bag and cosy fur blankets), a cooked breakfast in the morning, hot drinks and a scenic ski-mobile tour back to Wire Plain. The morning ends at approximately 10am, when you will be returned to the Wire Plain car park after your scenic ski-mobile ride. 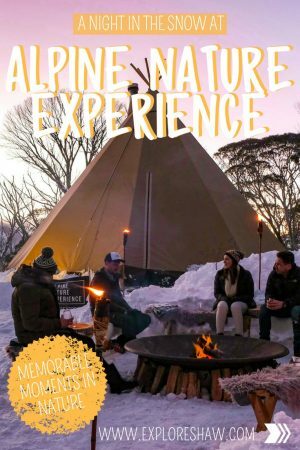 Bookings are essential for the Alpine Nature Experience. Same day bookings must be made before 2pm. The meeting point for the evening is in front of the ski shelter next to the Wire Plain car park at bus stop number 12. You can catch the free Hotham bus to this bus stop. For those travelling with a car, we parked at the overnight car park, just one car park over from Wire Plain. 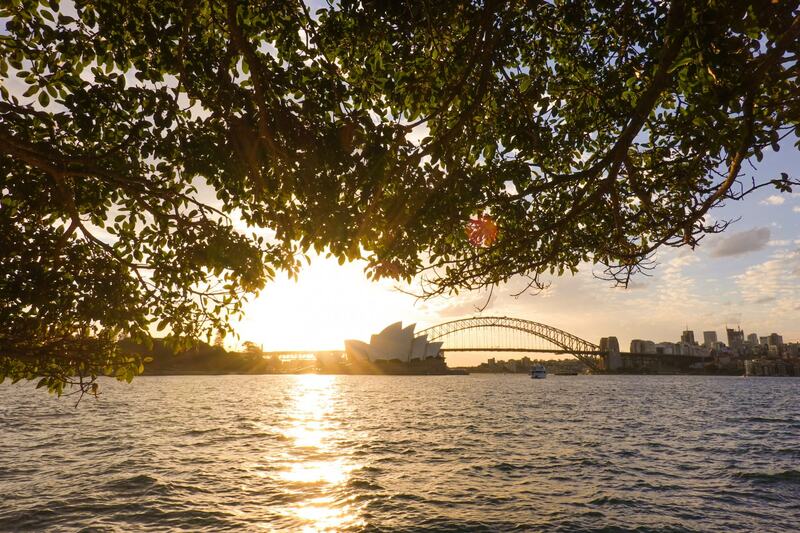 From the overnight car park, it’s only a short walk (less than 5 minutes) to the meeting point. As someone who craves the sunshine, loves hot weather and is regularly trying to escape winter, I wasn’t sure how I would go in the snow. 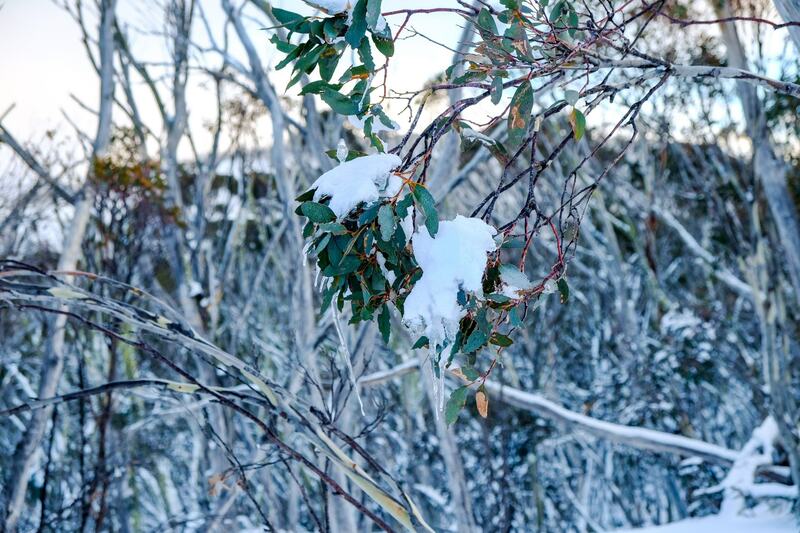 Even though I wanted to visit Hotham and was very excited about what we had planned, I was still a little bit nervous that it would be too cold and harsh for me. 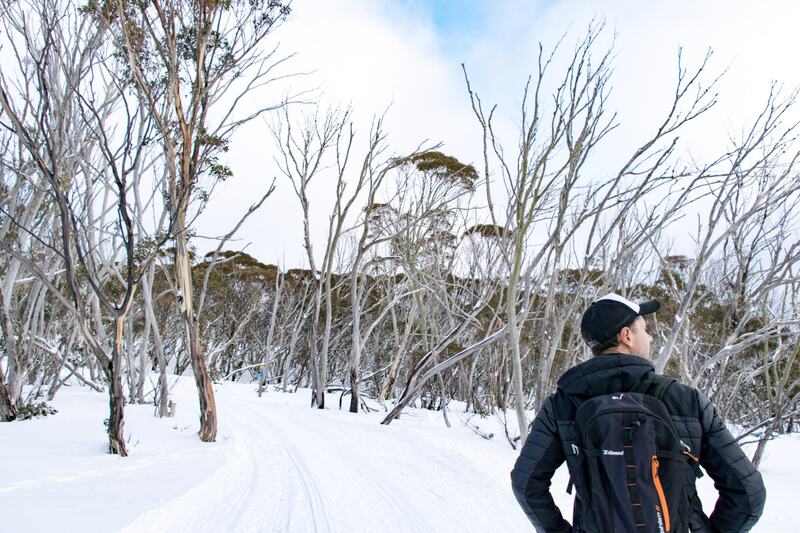 However, this is the absolute perfect experience for anyone who is unsure or nervous about visiting the snow for the first time, or who isn’t really a fan of skiing or snowboarding and is looking for something a little bit different. 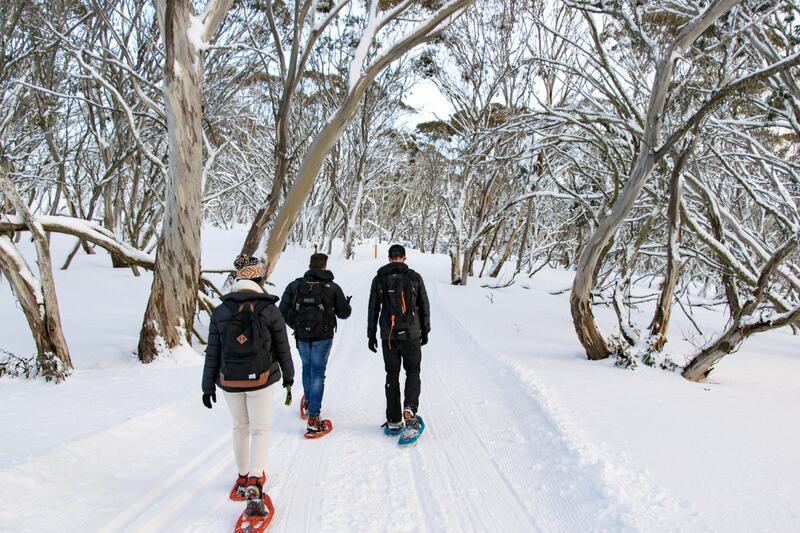 It’s a brilliant place to experience the snow and Victoria’s alpine region for the first time and to get out of your comfort zone and completely immerse yourself in nature. We couldn’t recommend the Alpine Nature Experience highly enough. 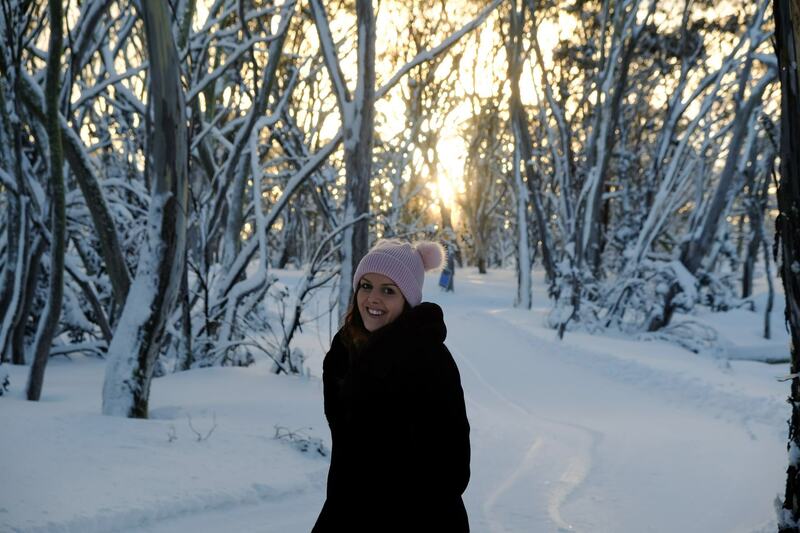 It was a truly unique and unforgettable experience and a perfect introduction to Victorian snowfields. Jean-François has built this eco-village so beautifully and really offers a wonderfully engaging and entertaining evening in the snow. 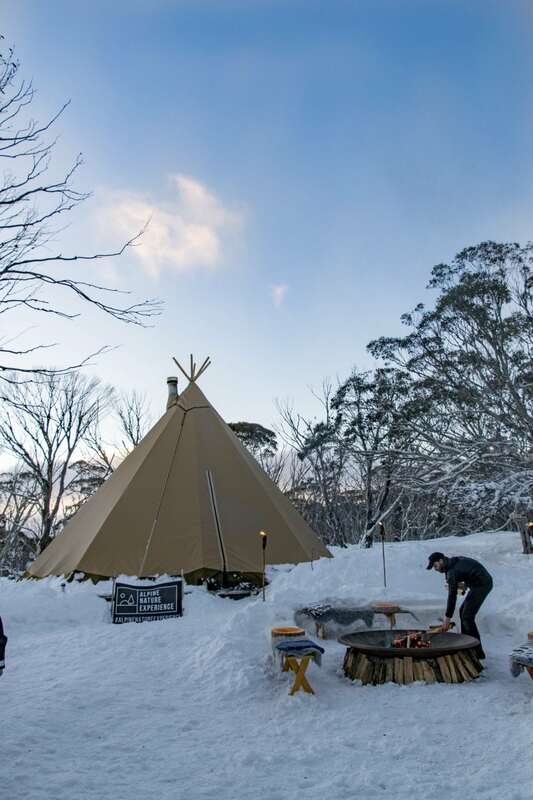 Find out everything you need to know about the Alpine Nature Experience and book your night in the snow on their website HERE. We experienced Alpine Nature Experience as a guest of Jean-François and the team. All opinions, as always, are our own. This looks like so much fun! It kind of reminds me of a time I went snowshoeing and ate fondue in Switzerland (it was a struggle and a half – we were told it was 1 mile but it was actually six LOL). Oh no! 6 miles in the snow would have been so tiring!! !